I consider myself so lucky to live in a place that is truly interesting. No boring subdivisions here in Quincy. Each house in our little town is special, unique . . . and so is each garden. There is a definite sense of place in Quincy. The houses are characters, and so are the trees, the granddaddy live oaks with all their humps and warts and their robes of ferns; there's no mistaking one for another. The McFarlin-Lester House. This fancy Victorian, with its turret and stained glass, was built by a prominent shade tobacco planter, John Lee McFarlin, in 1895. McFarlin actually helped develop the shade tobacco growing process. The house is three stories tall and has an enormous wrap-around porch surrounded by aged camellias, hydrangeas, and Japanese magnolias. There are big bays and towers and lots of lacy trimmings, and everything is elaborately painted in the old "painted lady" style. I don't know anything about the history of this house, but I love it. It's so Gothic. I wish you could see how dark and romantic the yard really is, tented by giant live oaks and so much Spanish moss. Ordinary garden plants have grown enormous with time and neglect; dark hollies cover several of the windows on the lower floor. The front door is so grand, with huge expanses of leaded glass, diamonds that catch the dim light. Who lives here? Baby Jane Hudson and her sister, Blanche? The house is so dark, so mysterious, so quiet; it never gives a hint. The Davidson-Thomas House. This house was built in 1859 by J.E.A. Davidson, who served as a state senator for Gadsden County. The marvelous semi-circular porch, with its huge Corinthian columns, wasn't added until 1890. When I was a kid, some family friends lived in this house for a few years, in the '70s. 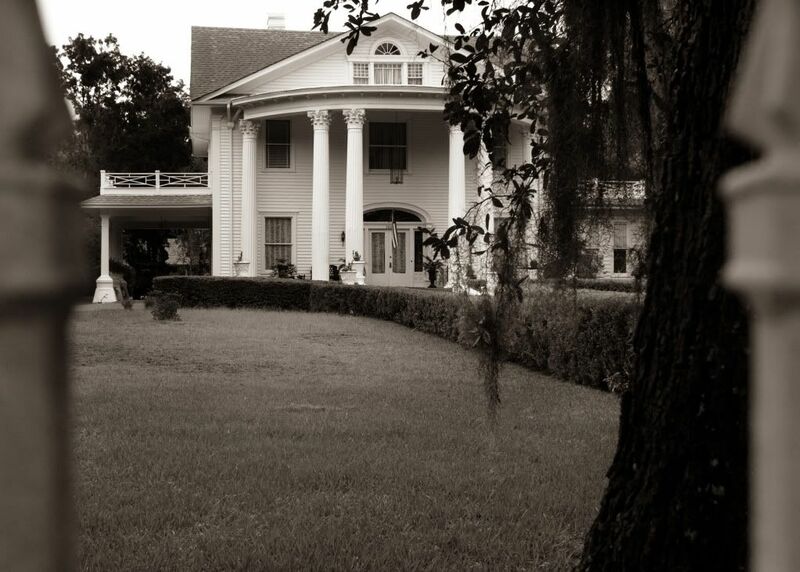 And one time, when I was nine, we even got to visit, got to have a picnic under the pecan trees in the yard and explore the house's secret passageways (yes, there were secret passageways!). I remember peering through fan-shaped windows, and coming into the grand entry room with its foggy gilt mirrors 15 feet high. . . . I never forgot. That visit was a life-changing experience for me. Ever afterward I always wanted to live in Quincy myself, in my own old house. And now I do. I made that dream come true. Hi Leslie...I love all things 'old Florida' and your beautiful little town of Quincy still has that wonderful feeling of 'old Florida.' 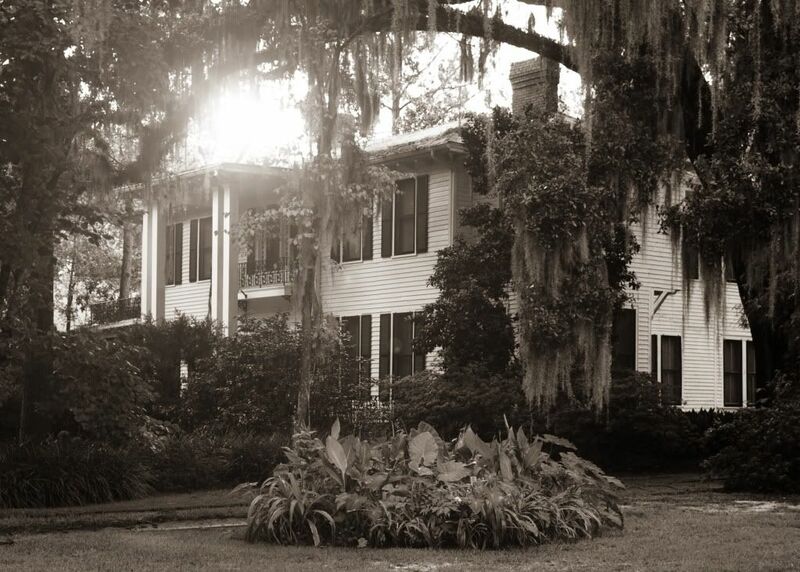 Stately old homes and wonderful oaks...oh how I wish all of Florida still looked like this. I live a bit south of you in a sleepy 'old florida' city that developers have mostly passed by for now, but sadly are steadily moving closer to. Hope that never happens to Quincy. You can see my bit of 'old Florida' on my other blog: http://lifeinoldflorida.blogspot.com. Hope you enjoy it. p.s. love the black and white photos. Oh, I will check it out. Thanks! Thanks so much for visiting my blog. 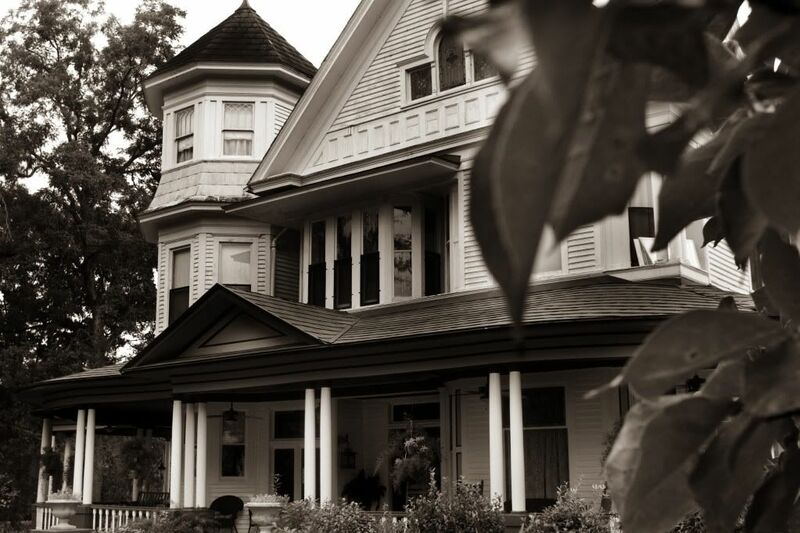 My husband and I have stayed at the McFarlin house many, many times. I believe the third house you feature is across the street from it behind large iron gates? We love the town of Quincy and its surroundings. Like Susan we are fans of any 'old Florida' areas and spend lots of time in the coastal towns of the panhandle. So nice to 'meet' you. Hi Meems, it's so neat that you've stayed at the McFarlin House. I bet it's wonderful inside. Yes, the Davidson-Thomas House is right across the street behind the big iron gates. I guess it's a pretty memorable house!